New for 2019 are Virtual Races! If you are choosing to run virtually, please read all of the notes about virtual events before signing up – and yes, you can sign up for multiple virtual events and earn the medals if you’d like. If you have any trouble registering, please click here. All participants will receive a race shirt at packet pickup. These are extremely soft and comfortable shirts and come in unisex sizing. During registration you will select your size and have the ability to change this size up until a couple of weeks prior to race day. We also have a shirt swap station based on availability during the expo if you don’t like your size. Our medals are not ordinary, they are MASSIVE 3D medals that all finishers earn when they cross the finish line. 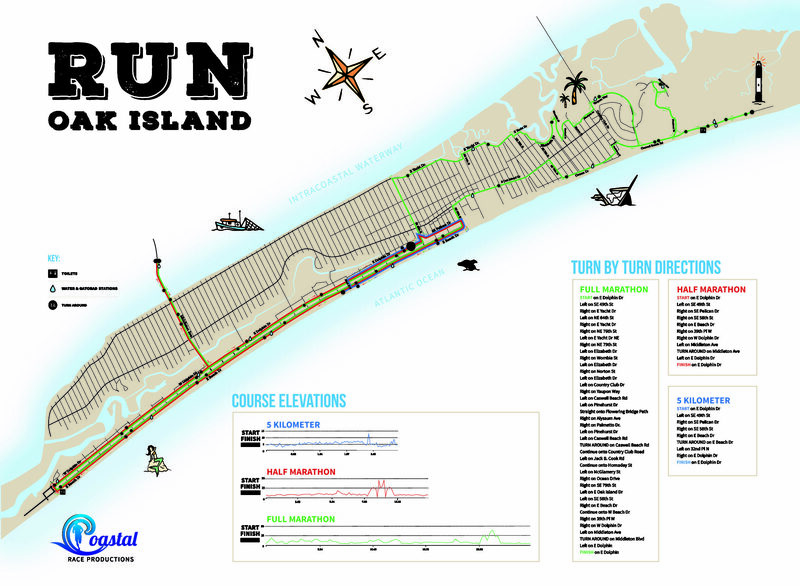 Shown below, you will see the full marathon is the largest at around 9″, the half is around 7.5″ and the 5K is about 4.5″ – all virtually the same design. The mythical mermaid miler has a cute finisher medal too. Parking is located around the start/finish line. For directions you can use the address: 4602 E. Dolphin Dr. Oak Island, NC 28465 -or- (click here for directions). Be sure to bring your pre-race hydration of choice and show up a little early – we recommend about 60 minutes prior to your start time however packet pickup begins at 5:15am. Parking will be near the start/finish line. It is ok to park on the side of the road as long as all 4 tires are off of the road. The full marathon starts at 6:45am, half marathon start at 7:00am and the 5K starts at 7:15 sharp so don’t be late. All of the events start and finish at the same place on Dolphin Dr. in front of Middleton Park. You want to make sure to give yourself plenty of time to get parked and warmed up. Saftey is our #1 priority. While we work with local authorities and DOT to shut down as many roads as possible, a portion of the course is open to vehicles so it’s important to be aware. We discourage headphones and no dogs are allowed per USATF sanctioning. Follow our directional signs, volunteers and law enforcement – they know the course and where you need to be running. Use every water stop to stay hydrated on the course and have fun, we’ll see you at the finish line! Hang around a while. We’ll have the DJ playing your favorite tunes, post race food, beer and games – plus awards for top 3 overall male and female as well as age groups (every 5 years) for both the 5K and Half Marathon male and female runners. Bring a chair if you’d like, signs to cheer on others and enjoy the after party with us! *Must be present to receive awards – we don not ship them! From 2-7pm on Friday February 15th. We STRONGLY urge you to show up during this time on Friday if at all possible. If you absolutely cannot make it during this time, we will allow packets to be picked up the morning of the race by our start/finish line but please show up extra early! Packet pickup will close at 6:15am for ALL races on Saturday morning 2/17. 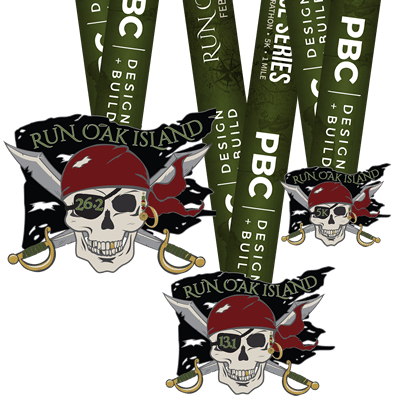 On Friday, our expo and packet pickup will be located at the Oak Island Parks and Recreation Center located at 3003 E Oak Island Dr, Oak Island, NC 28465 Click Here for directions. We will have several vendors here and you’ll be able to pickup your bib and tshirt. We will be taking late registration for any events that are not sold out. We will have VERY limited time for packet pickup the morning of the race between 5:15 – 6:30am on February 16th, Saturday morning so we strongly urge you to pick up on Friday if at all possible. If there is no way you can make it on Friday, please consider having a family member or friend pick it up for you. If you have no other option you MUST come extra early on Saturday – plan at least 1 hour for parking and picking up your packet. There are many great accommodations on and around the island. I would recommend contacting the local chamber of commerce. Holiday Inn Express & Suites has a special rate for race participants. When making your reservation you will need to call the Hotel at (910) 253-9100 and tell them you are coming to Run Oak Island. We partner with a professional Timing Company that will provide accurate results. Yes! Our 1 Mile and 5K races have no time limit and our half marathon time limit is 3.5 hours (16 min miles) – plenty of time to walk most of the course if you’d like. The full marathon will have 16 different water stops along the route and the half marathon will have 8 different water stops along the 13.1 mile course. All stops have water and Gatorade. There is 1 water stop along the 5K course as well.We will have a truck monitoring the route with water and acting as a “SAG” wagon. Volunteers from the Holden Beach Turtle Patrol are assisting on the course for directions, as well as at the finish line and all of the water stops.Signage is marked on the ground, over 100 directional signs, and a biker will lead both courses. We have 8′ flag mile markers for every mile on both the 5K and Half Marathon.There are over 20 portajohns/toilets at the start finish line and 2 that you pass twice on the half marathon course so 4 potty breaks on the total.Post race nourishment includes bananas, gatorade, pizza and beer!You’re going to LOVE running a Coastal Race Productions event! We do provide race day photos and our awesome photographer tries to get some of everyone! If you see her please thank her for all of the awesome FREE photos to enjoy! These will all be uploaded to our Facebook page please feel free to tag yourself and share with your friends and family. Visit our General FAQ’s page for answer’s to all of your questions regarding Coastal Race Events. Make the most of 2019! Whether you’ve set a new goal, tackling a new distance or want to push for that new PR we are here to help you! Let our Certifed RunningCoach write a training plan specifically for you! We are here to help you achieve your goals! Jump on over to RunCRP to learn more! Volunteers are loved by all! We would be thrilled to have you join our race day team. Waterstops, Intersection Cheerleaders, Start/Finish Line – we need it all. We rely on some key non-profits that we partner with locally but we could always use some extra support. If you’re interested in volunteering with us, please register by clicking here. All volunteers receive a free race shirt too! Thank you! Coastal Race Productions support a number of Non-Profits throughout Brunswick County as well as the American Red Cross! Please consider making a donation today! To make a donation CLICK HERE – Thank you! 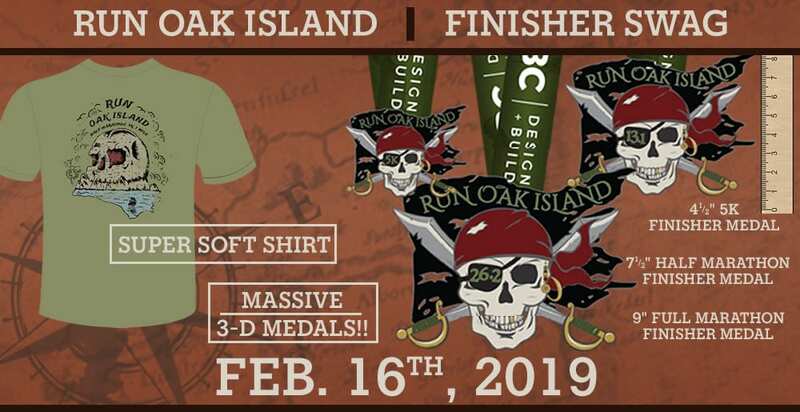 Results for previous Run Oak Island events as well as current Run Oak Island Results and Course Records are listed below.